India is a beautiful country and it's people even more wonderful. We are passionate about everything we do. But we falter when this passion is unknowingly converted to fanaticism, losing all pragmatism, especially when it comes to our national cricket team. One victory and the country has found its heroes; one loss and they are thrown down in the dumps. When will we, in the form of media, ex-cricketers and general public, stop doing it? Will we ever? I hope so that we will, atleast with this present team. They are a young team with a young captain. They have shown tremendous potential to emerge as a team that could be a frontrunner in international cricket. After a long time the Indian team is looking and playing like a team. They are playing for each other, for their team and not for personal glory. They have made mistakes (who doesn't? ), but a look at the present lot and one gets the feeling they will learn from them in the future. In the last few months they have won more than lost. Let me begin first with the captain. It is not an easy job, especially if you captain an Indian side. 'Gunning for Ganguly'. Yes, it aptly describes the media blast at the Indian cricket captain. I mean, all that is left, is to actually take a gun and shoot him. Hey guys, spare the chap, let him rule in peace. After a long time India has a captain who stands up for the team, voices his opinions to the board fearlessly and enjoys the respect of his young team members. He has formed an impressive combination with the coach, Mr. John Wright, the vice-captain, Rahul Dravid, and Sachin Tendulkar. Together they have shown the potential to develop this young team into a formidable opposition and a winner. He might have had a poor run of form -- well, which Indian captain hasn't? -- though I sincerely believe Tendulkar never had poor form as captain. If scoring 1000 runs in both Tests and one-dayers in one year when he was captain is termed as poor form, we need to look up the terminology again or redefine it for Tendulkar. 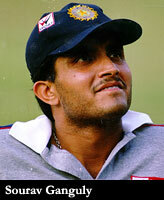 Ganguly is termed as the "Royal brat of international cricket", or the "rich spoilt kid". In fact, I think the Australian media is the culprit for this. Many papers and sites in India carried their opinions as if it was the final word. That makes us culprits too. The fact that Ganguly was giving the Australians back, in their own words, pricked them real hard. He added salt to the biggest wound they had suffered, a defeat in the Test series, when victory seemed a few millimeters away. He was beating Steve Waugh (for whom I have immense respect as a captain and a player. If ever there is a title called 'King of captains', Steve deserves it) and his team at their own mind games. In the process, to put it very simply, he was getting on their nerves. Adding more oil to the fire, Ganguly went on, to quote: "If they do it, it is gamesmanship, but if we do the same, it is termed as arrogance." This forthrightness probably gets to most people. He may sometimes be brash, but beneath lies the passion to win, to see India at top and the will to succeed every time his team steps out on field. He hasn't done everything right but he hasn't done too much wrong either. There are sure signs that given a long tenure, security and the team he desires, he will do more right than wrong. He has been more verbal (on-field and off-field) than most Indian captains. But if I'm not mistaken he has been reprimanded on those (on-field) occasions by the match referees. And let's not even get into the suspension issues; the debate would make up for another article. I feel he will prove to be a good captain especially with the youngsters, because he knows the insecurities a player can go through when he is new to the international cricket. Ganguly made a comeback from wilderness after five years, that too when he had earned a much maligned reputation on the infamous 1991-92 tour Down Under. He can relate to these youngsters more closely, and is keen to give a player more chances to prove himself. He is a firm believer that one cannot judge a player by just one performance. He shows a lot of faith in his youngsters. For example, he fought for Harbhajan, Sehwag and Yuvraj, to have them in the side. They too have proved him right by coming up with match-winning performances. The media should stop cooking up stories and leave the team alone. The team lost a final and suddenly there are talks of friction between Tendulkar and Ganguly doing the rounds. When will we learn to accept that losing is part and parcel of the game? There are reports of Tendulkar skipping the tri-series due to this conflict more than injury reasons. Actually, all those who doubt Tendulkar's commitment to the game, to the team, to the country, and to his captain should seriously quit watching cricket. The game could do without them. Now people are saying that Dravid should take over as captain, but when Dravid suffers a bad-patch who will be in line, next? You won't find better team men than Sachin Tendulkar and Rahul Dravid. They are Sourav Ganguly's biggest assets. He knows that for a fact and values them too. There is absolutely no reason to create any kind of tension between the 'Big Three' of the Indian team. The team could do without these rumours. One look at the three when they play together and you get the feeling that they compliment each other the best. The team, with the experience of the senior players (who are not that senior considering they are only 28!!) and the exuberance and spirit of youngsters is showing signs of developing into a fine unit. They are learning the positive approach to the game and developing the attitude to fight and never give up. 1. India's unexpected win over Australia in the ICC knockout and then a polished victory over South Africa to reach finals to everyone's astonishment. Yuvraj Singh, Zaheer Khan and captain Sourav played important roles there. 2. The famous comeback ever, in cricketing history: Laxman, Dravid and Harbhajan rewriting record books in the Kolkatta Test versus Australia. 3. 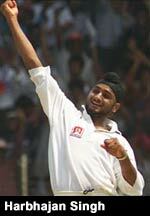 Harbhajan, again, with his magical fingers spins a web around the Aussies. India clinches series 2-1 from 0-1 down. 4. India is reeling at 80/5, chasing 290 set by the West Indies in the final of the tri-series in Zimbabwe. Sodhi and Dighe fight it out valiantly to just lose marginally. Not too sad about the loss, because India showed fighting spirit. It counts sometimes more than victories! 5. The latest series, India loses its first three league matches. All the next matches virtual semi-finals. The youngsters do it again to pull India right into the final. This, when no Sachin Tendulkar is around. Give them credit guys; I know we stumbled at the last hurdle. But that's no reason to forget their previous performance. It takes a strong performance to get to the final too. That's why I maintain they have made mistakes, but they will learn. They'll definitely make it past the last hurdle in the near future. Besides, we all know how one-day cricket is, their Test performance should matter most. 1. Shiv Sunder Das: After Sunil Gavaskar, India never found a reliable opener. In the process, Das seems to be God sent. Patience personified isn't he? 2. Ashish Nehra: What a comeback, I wonder what he was (or rather our selectors) doing for the last two years after playing in the Test championship. Never mind, he is here to stay as long as injuries don't become too frequent. 3. Zaheer Khan: My favourite, for his sheer pace. If he controls his balls well, boy, do we have a good duo leading our pace attack. 4. Yuvraj Singh: He has the talent and the shots. He could do with a little more patience though. He bowled well within his limits this series and his fielding is definitely an inch above most Indians. Test place a long wait still, but he should be a permanent member in the one-day side. 5. Reetinder Sodhi: Has matured in the last couple of series. An enthusiast on field, a fighter to the core. There are few others in waiting too. So the learning process is on and let's not hamper it by asking for their captain's head. Let's not criticize the team over its losses so harshly. The team could do with encouragement and support from their own people, not when they win but when they lose, especially if they haven't fallen short in their efforts. The team needs stability, and the captain, security. It is well-known that a captain is as good as his team is. We have the core here -- talented players, who when worked upon will be able to deliver at the most testing times. We have a team in the making that looks good for the World Cup. We should start thinking with the future in view. Give them time; give him time; be patient. There is an old saying that "Patience pays." So let's wait. Win, as if you were used to it; lose, as if you enjoyed it for a change.